I want to start this whole story with the ending. All is well and everything turned out okay! Out of respect for the individual that needed our help, I am withholding their name and will instead call them Fred. Their llamas will be referred to as Jerry and Tom. This was a very frustration situation for them and I do not want to embarrass them. Jeff and I were taking a mini vacation at an RV park on Tuesday. 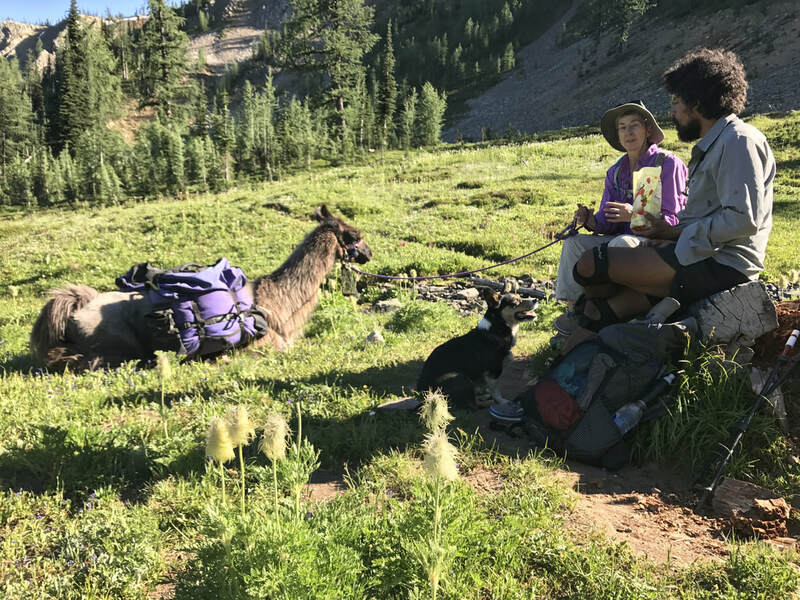 I was sitting by the pool when I got a call from Fred's wife letting me know that Jerry their pack llama was down 13 miles in on the PCT stretch near Winthrop Washington. Fred had a satellite phone that he was conversing with his wife over to let her know where he was at etc.. We talked through potential reasons that Jerry might be down and possible options. I asked her to keep me posted. Wednesday morning I had a message from Fred's wife again saying nothing had changed. Jerry was still down. I promised her I would head home and get to work on solutions, potential reinforcements etc.. We left our mini vacation and headed home. I expressed at that time to Jeff that I was worried about Fred's age, his fairly new ownership of llamas and what could possibly be going on with Jerry? I started with calling the various ranger stations and finally did get a live person. This individual was very helpful and gave me other numbers. 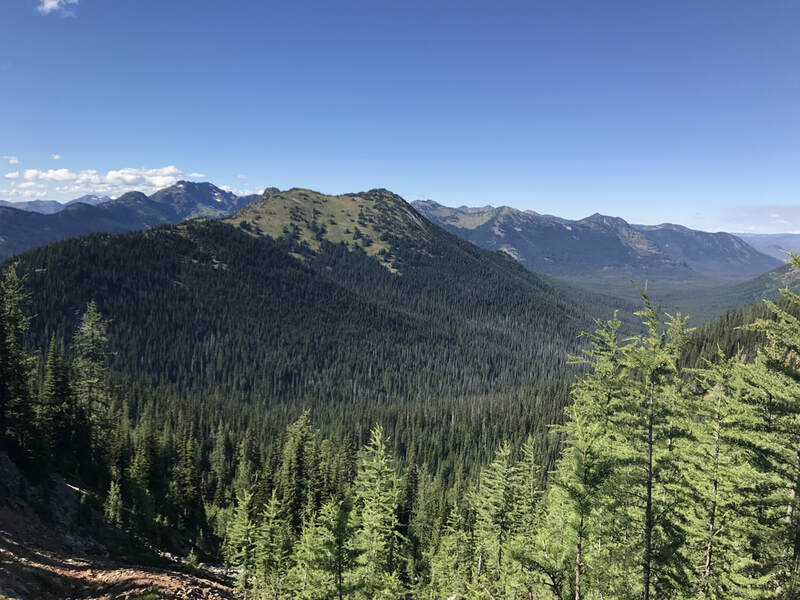 I began to leave messages with trail crew leaders, the local Mazama store and several ranger stations. I finally worked out several possibilities of what could be going on with Jerry. I called Fred's wife and gave her the name of a local horse outfit and then promised I would call a vet office near that area and see if they would release drugs to be packed in to Fred. My thought was that a horse packer could get to him a lot quicker than any of us. If Jerry was going downhill, it was important to get him potential drugs to improve his condition. I found a vet office willing to issue drugs like Ivomec, Banamine, IV fluids etc..
All during this I began getting short text messages too from Fred off his satellite phone. He had left Jerry behind tied to a tree and was 4 miles out from that spot. At this point I told him he essentially had left a pork chop hanging for any cougar, wolf or bear in the area and to PLEASE go back to Jerry. We were working on getting him help, please stay put and do NOT leave Jerry! All afternoon, I had been talking to Fred's wife off and on. I finally told her that if we didn't hear back by early evening from the horse packer, I was going to pull the trigger and head in myself. At this point I called a packing friend Lisi Ott and asked her what her plans were for the next few days. Lisi and her husband Jeff pack a fair amount and are very capable back country hikers. My thought was that if we had to get Jerry up, we would need several people. Also, I wanted input from someone else besides myself! She agreed that it was getting to be a dire situation and yes, she would definitely drop everything too and meet us if we went this route. For those of you that do not own llamas, there is a line when it becomes very hard to reverse the condition of the animal. When you get into that window you have a short period of time to act. After being down for two days, my concern was we were there. My gut feeling was that Jerry had Tick Paralysis. Where we live it is pretty rare, but over in Eastern Washington it is a major issue. 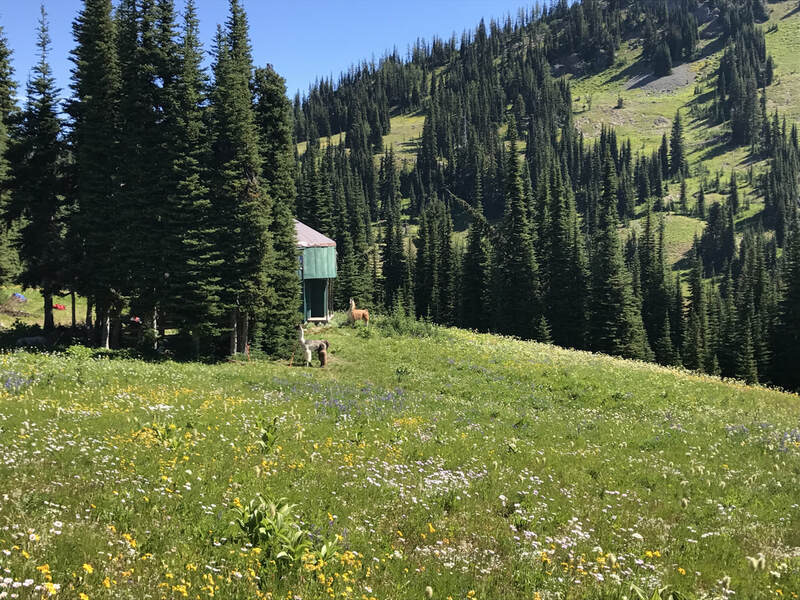 After talking to one of the vets in that area, he confirmed they had seen several horses with this issue in their area after being up in the high country. I began asking around and several packer friends agreed that I was probably right. I was also concerned about the owner who is very active, but in their 70's and a newer llama owner. One of his final transmissions that day (Wednesday) was "Can you come get him up?" I called Lisi and we agreed to meet at the trail the next day. Cayetano (my pack male) was in decent shape, but Ramazon our other choice had only had a pack on three times in his life. He had been out driving recently, but otherwise was not conditioned. All our other llamas were either too old, pregnant, too young or otherwise not suited. It would have to be Ramazon! My gut was that with his athleticism and conformation, he could easily do this. He is a very good driving llama. 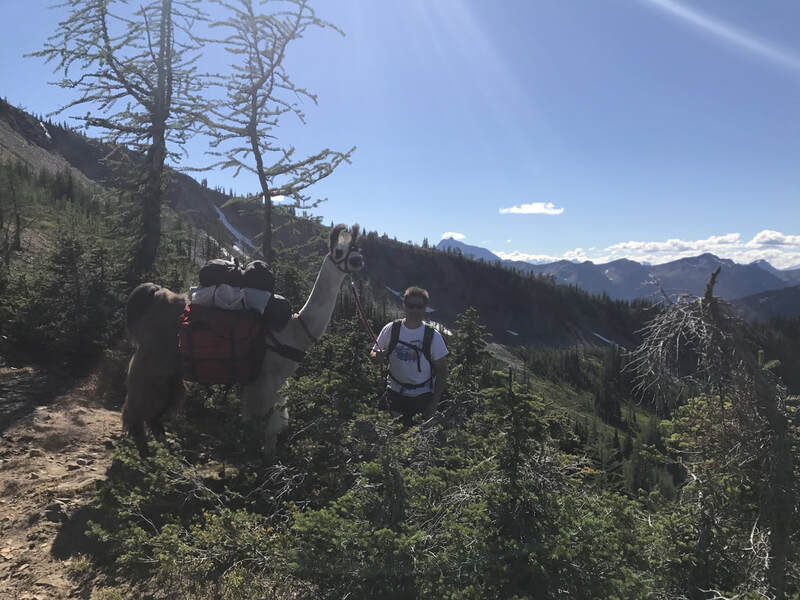 I do not recommend doing this usually, this is the stuff stories are made of with a llama down 2 miles in on the trail. Jeff and I stayed up until almost 2:00a.m. packing up and getting the farm situated. At about midnight, we looked at each other and said, "What are we going to do with Daisy?" 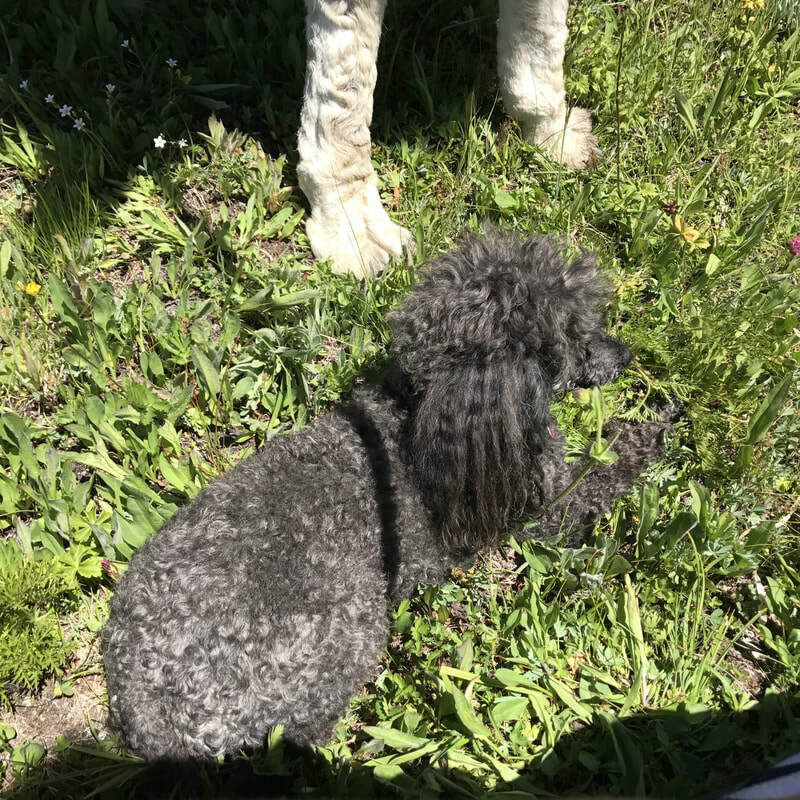 (Daisy is our 11 year old Miniature Poodle) Usually she gets farmed out to my dad's when we do this kind of stuff. I worry about her becoming coyote bait. We realized we had no time and would have to take her. In the past she rode on Eagle in Montana. We dug out her camel basket and threw it in the pile! At about 4:00a.m. we were both up and headed out the door to make tracks for Mazama Washington (about a 3-3.5 hour drive). I called Lisi to see how they were doing. They had to drive 3+ hours too. Jeff and I made it to the first ranger station and it wasn't even open yet. Jeff managed to track down a local guide having breakfast and found out more info about the area we needed to get to. We let the boys potty and loaded up again. All during this trip to the bottom of the mountain road, we had been communicating with Fred and Lisi. Our final message was that Jerry was up and had made it through the night tied to the tree. I told Fred to make his way our direction on the PCT and we would meet up. At that point he was 13 miles from the trail head. For those of you that don't pack, 13 miles in a day is pretty much pushing your limits. Most of us do 5-7 miles depending on terrain and incline. It also depends on how much weight you have on the animals. We had left things behind wanting to keep things as light as possible so we could cover miles. The boys were carrying roughly 70-75lbs each. We had our gear, food and vet supplies. The IV fluids alone were pretty heavy. Then there was that 10lb Poodle too! We loaded up our llamas and waited for Lisi and Jeff to get there so we could all head out. By this time it was noon. We helped them get their llamas packed up and out we all headed. Nearly 20 years ago, I packed this part of the PCT with ten women. For years I have told Jeff how badly I wanted to go there again. 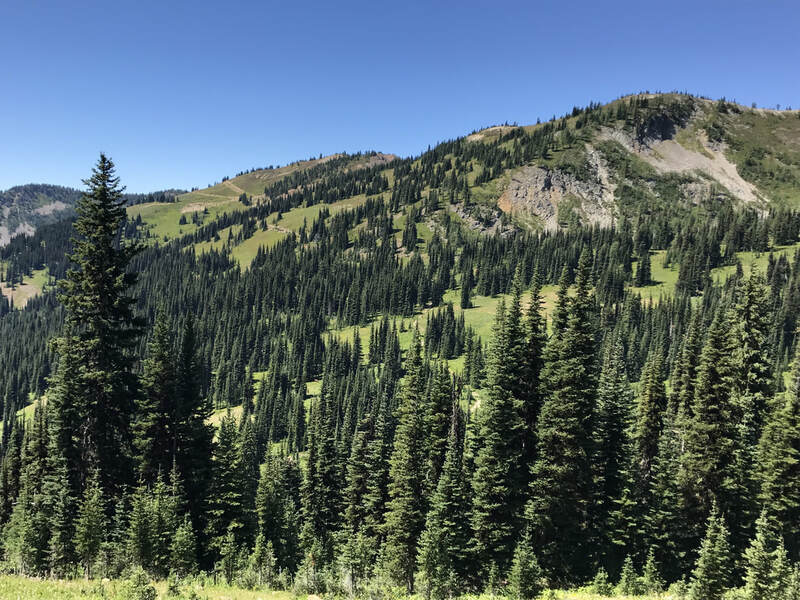 The scenery is amazing and you are on a ridge line for a good portion of the first 4-5 miles into Rainy Pass. When I was there 19 years ago, you could see old mining cabins down in the valleys. Near Rainy pass there was a yurt and old mining equipment. Also, an old mine shaft. We felt like Hansel and Gretal the whole afternoon. 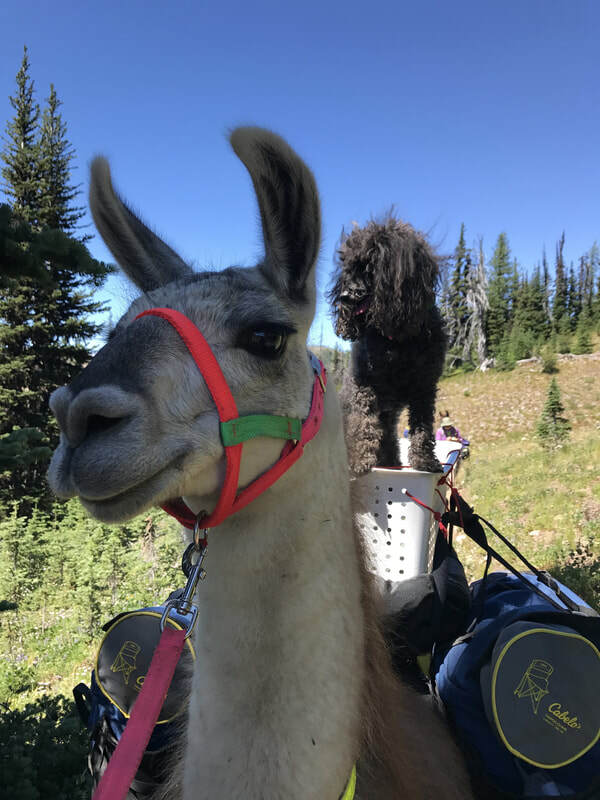 People that met us along the trail either said, "Cool you have llamas" or they said, "You are here to help Fred and Jerry! They are at (fill in the blank). We last saw them (fill in the blank)." 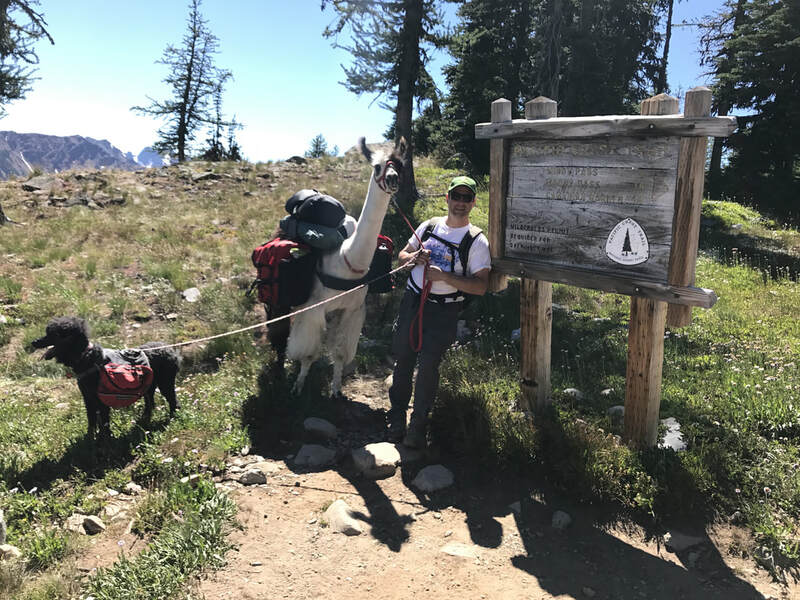 It got to be pretty entertaining as we first met the through hiker from GA who was there to hike the PCT, then the other hikers who had met Fred and wanted to give us details on how to find them. All in all, we ran into lots of nice hikers that gave us info. 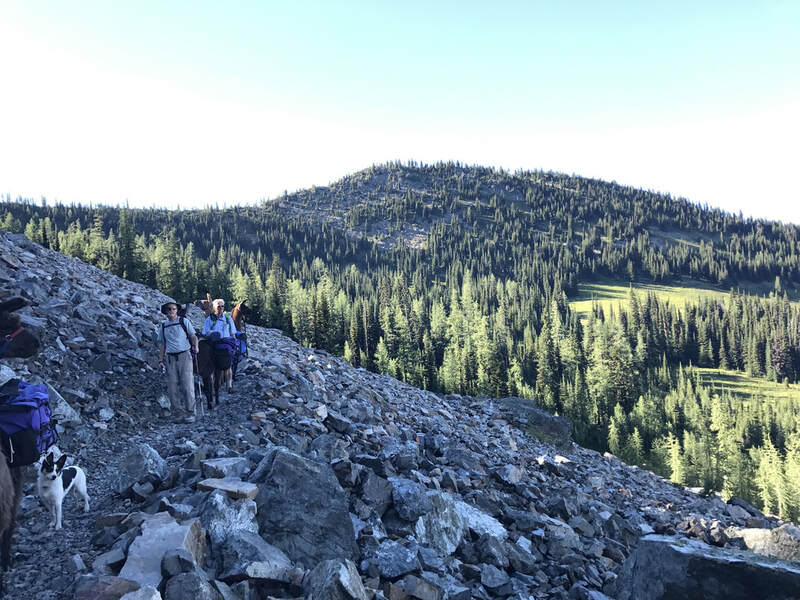 Upon reaching Rainy Pass area, a large group of teenagers with young supervisors from Outward Bound came out of the woods and yelled, "You came to rescue Fred and Jerry! Yeah!" It was obvious that they had enjoyed their time with Fred and his llamas. They told us that they had been with him the night before and were packing out Jerry's pack system and some of Fred's things. They were sweet kids and we stopped to rest and let them take pictures with the Poodles and llamas. At this point they told us we were still about 5 miles from Fred. We were all getting tired and hoped Fred had limped Jerry and Tom along further than five miles! They also told us they had last seen them in Holman Pass. We headed down the trail and worked our way up a trail that spilled out onto a large rocky area. As we rounded the area to head up on a ridge, we noticed a tent tucked down in a wooded area. At this point a middle aged man came out and said, "Hey you are here to help Fred and Jerry! I saw him this morning, he was in the Holman area." One thing I need to point out (as you are surmising) is that real backpackers are pretty awesome! There is a sort of code of ethics on the trail. You help if you can, you leave things like you were never there and you respect others. People were amazingly caring and helpful throughout this whole situation. We also never saw one speck of any garbage on the trail. You meet some very interesting people and there is always a story! The PCT is the highway of the back country. We headed up the ridge and at this point my feet ached. I have recently discovered I have arthritis in my right foot. Doing 8-10 miles was a lot. I secretly hoped that we would run into Fred soon. When we got to the top of the ridge, we had the most amazing view! We also saw plumes of smoke that were from a fire that had just broken out (we learned this later). Lisi who lives in Leavenworth immediately recognized the signs and explained why it looked that way. Jeff and Ramazon led the way the whole trip and as suspected, Ramazon out performed even our wildest expectations. He reminds me so much of his grandfather Eagle. I never had to condition or prepare Eagle as he was just athletic. I wouldn't recommend this normally! Once on the ridge, we began going along the ridge and could see the trail dropped down into the valley above. Jeff was ahead of the rest of us and suddenly yelled, "I see Fred! He has Jerry and Tom with him." This was met with an enthusiastic "WAHOOOOOOO" from our group! Fred told us to wait where we were and made his way up to the ridge. He was in pretty rough shape with a large bandage on his arm and blood on his shirt. You could tell he was very relieved to see us. I informed him, "We never leave our friends or llamas behind. You are stuck with us!" He told us that Jerry had gotten up that morning and they had been slowly making their way to us with lots of breaks. We asked Fred what he wanted to do and he decided he wanted to head down to the area where we had seen the tent camper. There was water there and that would allow me to evaluate and get some things into Jerry to make sure he continued to improve. A very cool couple hiking had realized that Jerry was down there and camped with him that night, so he hadn't been alone. That made us very happy! Again, those nice back country folks! Once down in the area below the ridge, we ran into a through hiker. 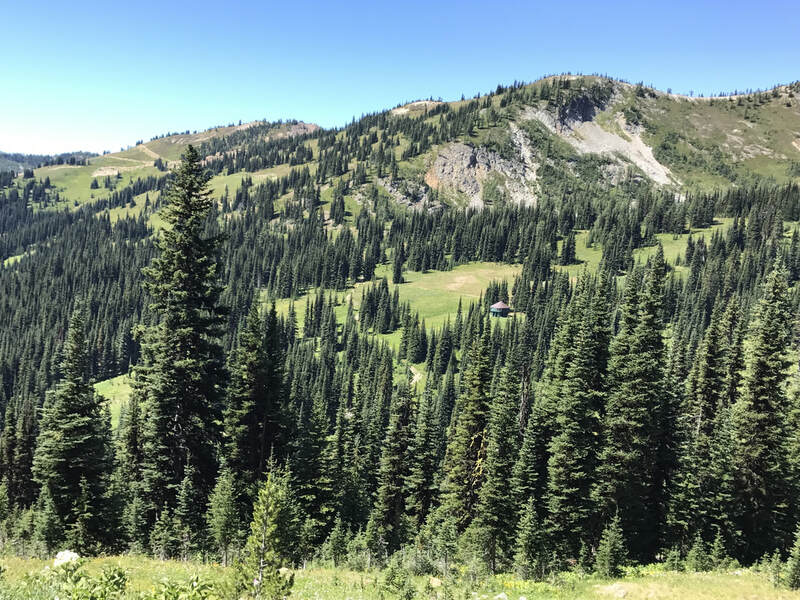 He had recently gotten out of the military where he had been a corpsman (medical worker) and was hiking the PCT to the Canadian border. He was planning to go into medical school soon. 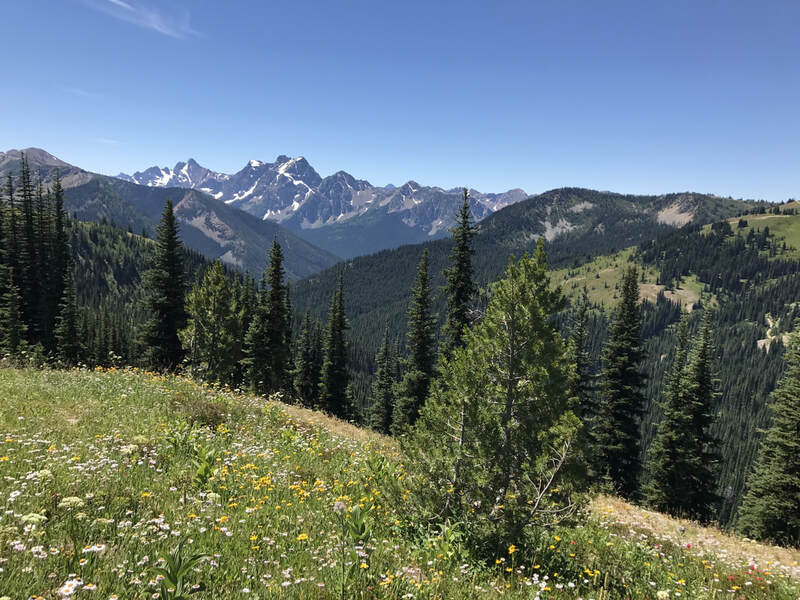 As an aside, if you don't know what the Pacific Crest Trail is, click HERE. Essentially it is over 2500 miles of trail that runs from the Mexico border to the Canadian border. It is on many people's bucket list and you run into a lot of people hiking from border to border. Some are even from other countries. We ran into people from Germany and several other countries. Lisi sat down and talked to the young man while he cooked his dinner. He informed us he was only carrying 10lbs including his food, clothes, tent etc.. While they chatted, Jeff held Jerry for me and I gave him a shot of Ivomec plus (for the possible tick situation), put electrolytes in water and drenched (essentially pouring it down his throat) him and took his temperature. It was normal. I told Fred we would let that sit for now and when we got to camp I would give him either Banamine or Maloxicam in case he was hurting. 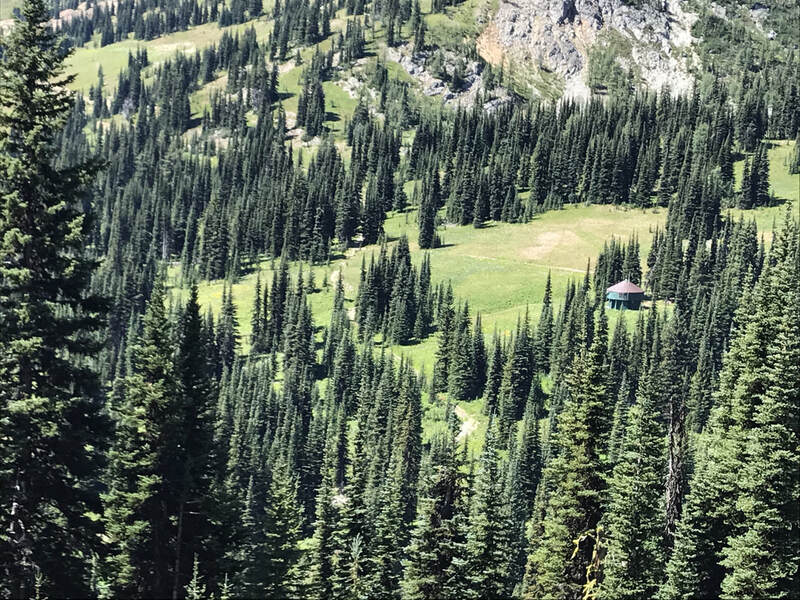 We all agreed to hike back to Rainy Pass area where the yurt was. I was elated as I wanted to explore that area again. I also knew there were multiple water sources there. One thing you are always aware of in the back country is where all of the water sources are. We bid goodbye to the young man and headed out. 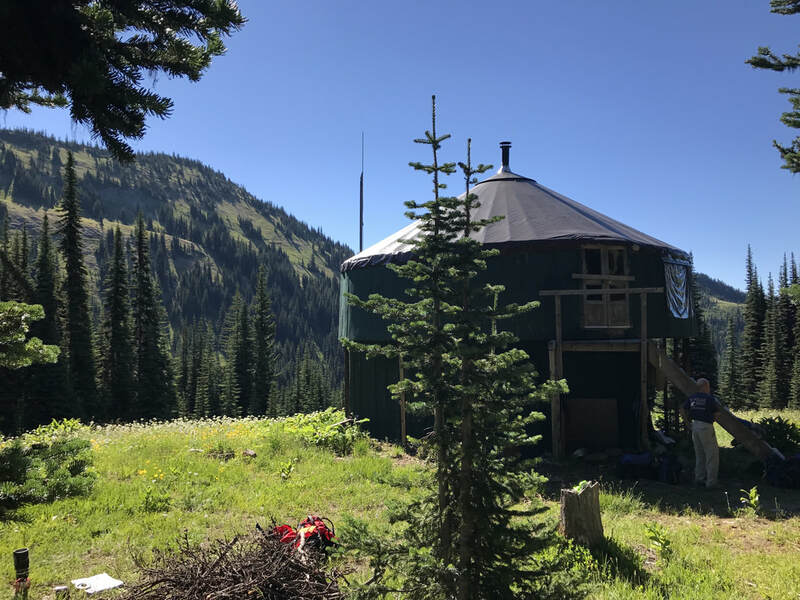 The yurt is used during the Winter for skiers or something like that. There was a board across the door and a rope figure eighted around the handle. When I had last been here, it was unlocked and you could go in. Obviously people had been bad or the local bears had been active. There were scratch marks around the door that looked like bear marks. We set up our tents in the tree area around the yurt and tied the llamas out. Directly in front of the yurt was what looked to be an older cabin. Like I said, this is a cool area to explore. We took care of Jerry and I sprayed him down with heavy duty fly, tick etc. spray. He seemed to be good and Fred seemed alright. We didn't want to make an issue of the situation and embarrass or beat him up. All of the animals got some Maloxicam. I figured given the rush and not conditioning properly, it was the kindest thing to do! As we we were sitting around after setting up, we all whined about leaving in haste and how nice a good glass of wine would be! We got situated for the night and the temps quickly dropped. Luckily I had thrown in one of Daisy's warm onesies. She gets cold easily and was miffed when we banished her with Sicily to our tent. We were freezing ourselves! Jeff had not been out packing with me in many years and was pretty hilarious. I had made sure to pack lots of freeze dried meat dishes for him. He shared one with me and then proceeded to eat two more and delved into a dessert one. At bedtime he planned to put all the food in our tent and I informed him I was not up for being "Bear bait" to put it away from our area. He really cracks me up! We all went to bed after deciding to pack up and head out in the morning. In the morning we all started to pack up and break things down. 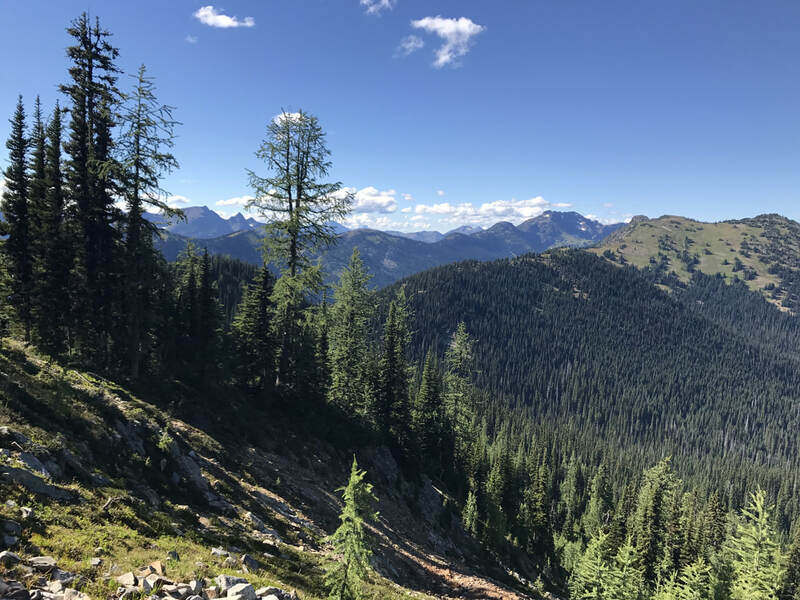 Fred wanted to take some time packing up, so I talked the other three into heading for a hike up the ridge to where the mining equipment, shaft etc. was. Jerry was much better that morning and we agreed he could probably wear his saddle out. Fred retrieved his saddle and gear from the Outward Bound kids who were camping near us. The rest of Jerry's gear was dispersed among Lisi's already light loaded llamas. When I was here nearly 19 years ago, the mine was much more exposed. This time the shaft was nearly buried. The equipment looked the same except the CPT was much more overgrown. We also saw bits and pieces of equipment on the hillside. All a record of what had happened here many years ago. 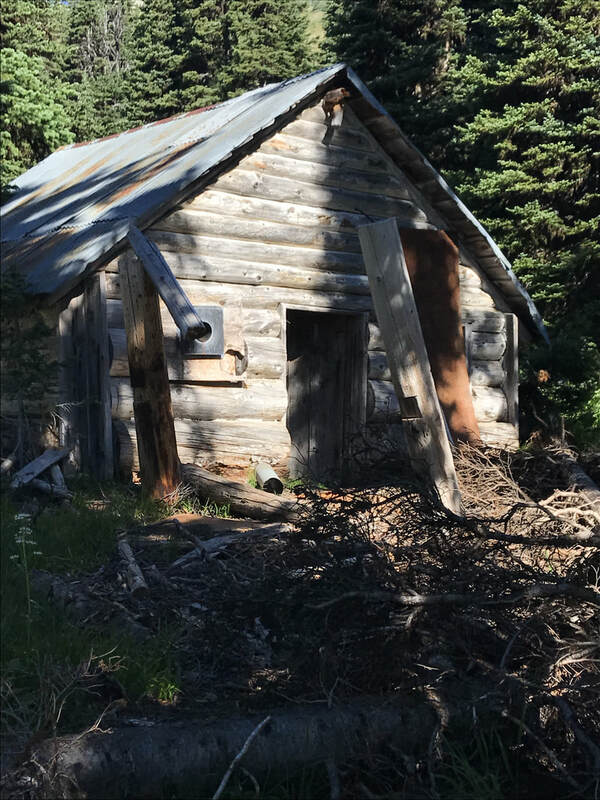 A local later told us that there are mining claims that are still active in that area. Prior to leaving we took lots of photos in the meadow. Nature's paintbrush was in full swing. It was beautiful! Even though I love red, Lisi's purple packs looked great with the flowers. I love taking pictures, but had to leave behind my good camera to save weight. Hence the darkness of some of the photos and overexposure in others. We headed out the way we came. 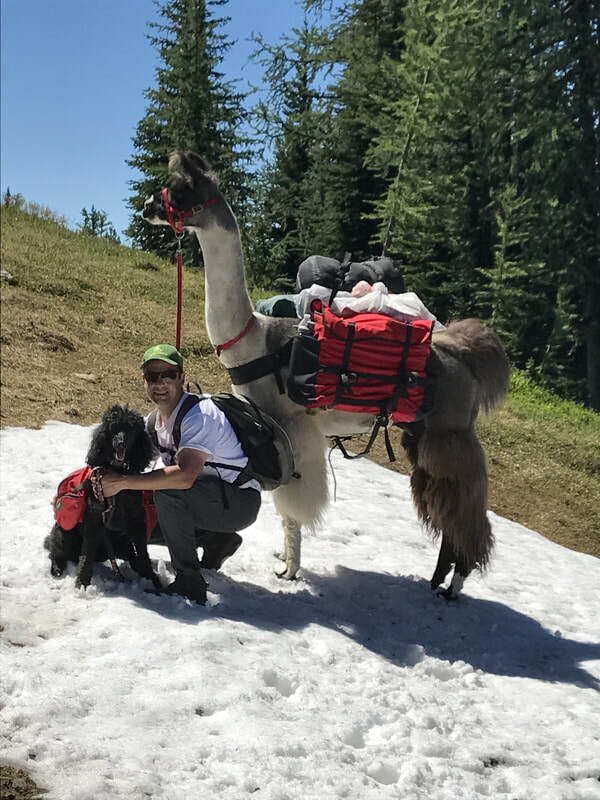 Our plan was to take things slowly with Fred bringing up the rear with his two llamas. We let him set the pace and schedule and took breaks when needed. The views here are absolutely stunning. You can't help but pause and smile. As we hiked up the trail you could follow where the yurt was on the hill. It was warmer than on the day before. 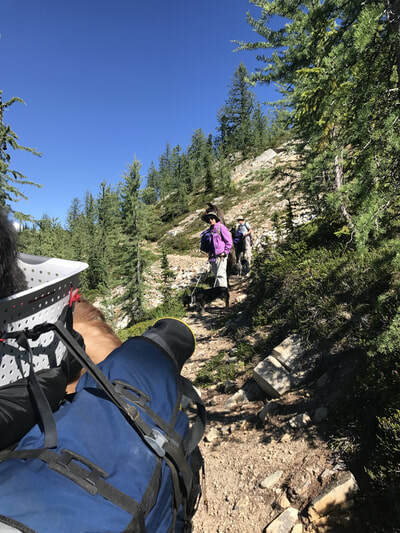 We met many people heading north on the PCT, always with an interesting story. We were steady and took breaks in the few shaded areas. About halfway, Fred showed us where he had found a water source and we rested the animals and snacked. Sicily Poodle stood in the water and napped by the creek. Daisy flopped over at Cayetano's feet. When I had come here previously it was August and there was a lot of snow on the mountain tops and on several spots on the trail. This time we only found one small patch of it despite it being only the end of July. The scenery continued to be amazing and the flowers were gorgeous! I made Jeff stop to let me take pictures. I so wished I had more than my cell phone. Jeff and I made it off the trail first and headed for the vehicles. It was a huge relief to be back there with all animals and humans accounted for! We had all parked bumper to bumper after finding where Fred had parked when we came. This road up is so treacherous that they do not allow trailers. 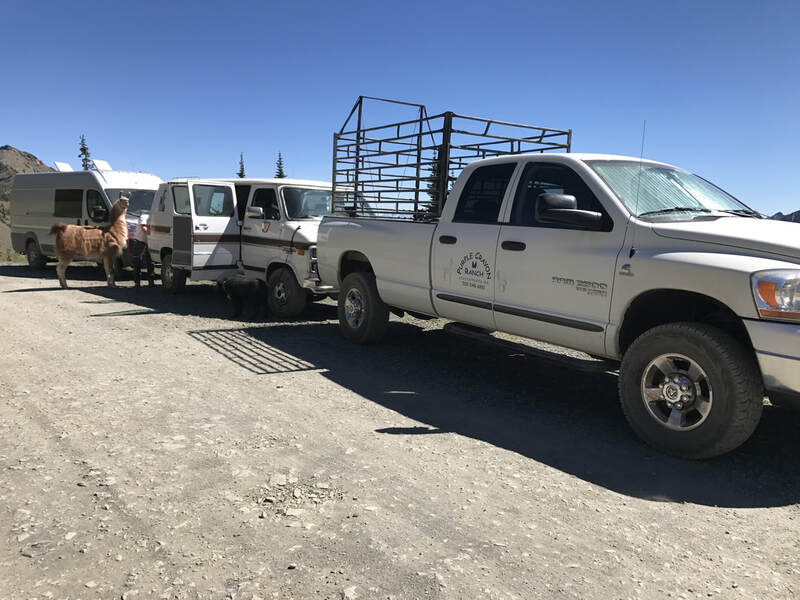 Even the forest service trail horses are brought in by truck. One curve is even named "Dead Horse Curve." Dead Horse Curve. One crazy driver nearly ran us off the mountain when coming down. He was going way too fast in a small sedan. We stopped at the Mazama Store and got coffee, other popular liquids and snacks. It was decided that we would head into Winthrop and see if the KOA there would feel sorry for us and let us stay to reset. It is always interesting to me how things work out. We pulled up at the KOA and went in. Trying to concoct how to explain our traveling circus. 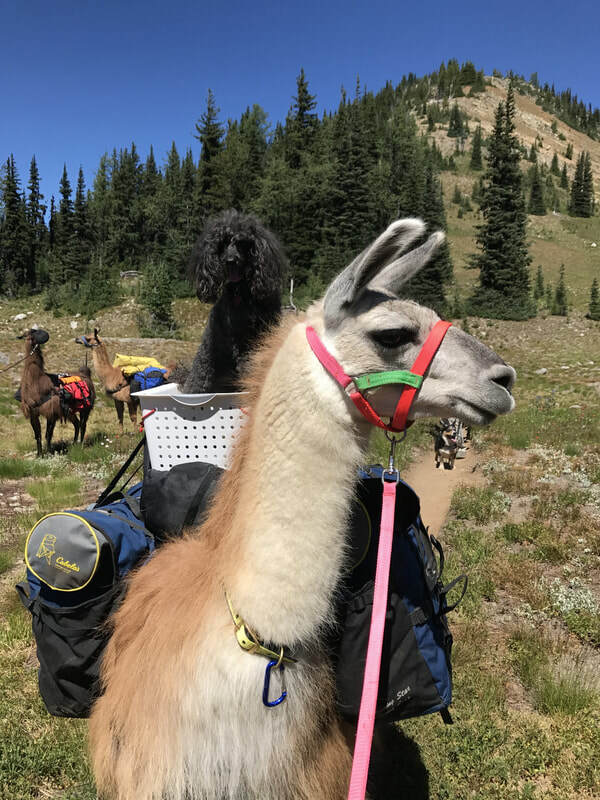 We asked the young man if they had any sites (which late afternoon on a Friday was a pipe dream I thought) for three campers and (pause, wait for it........) "Oh by the way, we have pack llamas with us. These are really nice well behaved llamas, yup we will clean up after ourselves etc." The young man called the owner/manager and he said to my Jeff, "Hop in my cart, I want to show you something." Turned out he had three tent sites next to a field they rent but do not use. He wanted to know if this would work for us? HECK yeah! We sweetened the deal by offering for them to come down when we were set up and see the llamas and get pictures. They were so friendly, helpful and kind to us. We were totally exhausted. I can't say enough good things about these folks and that KOA. Jeff and I are huge fans of KOA facilities and seek them out when traveling. Not one has ever turned our traveling circus down. Jeff and I went to town and bought shampoo, etc.. Also, got pizza for everyone to eat for dinner so we could all relax. 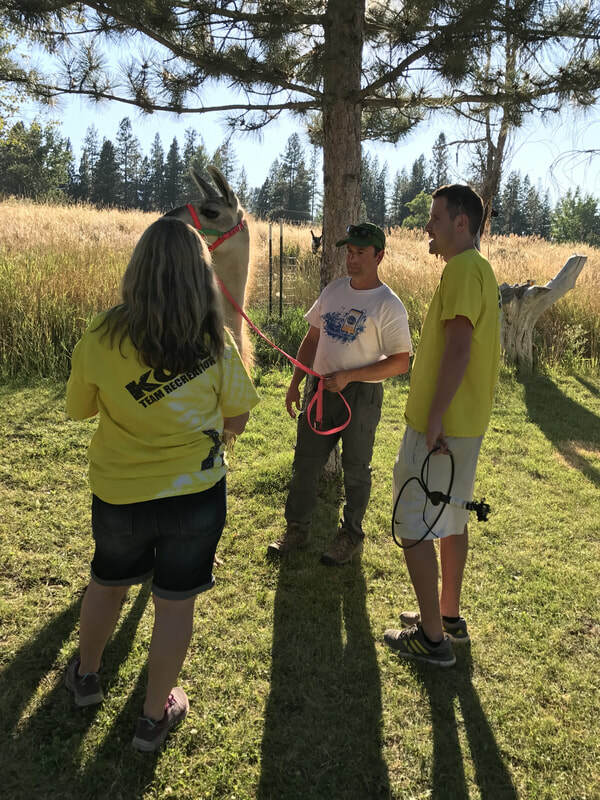 People immediately began to insist on the usual petting, questions and other things that go with having llamas with you. We all took turns doing the PR thing. Finally, I saw another group come up while we were eating, so I said I would take my turn. I spoke to them for awhile, they were from Bellingham and OH by the way, one was a former student from our school Chelsea F (for those of you that work at Baker H.S.) that graduated about five years ago. We got set up, showered and went to bed. Planning to leave in the morning for home. 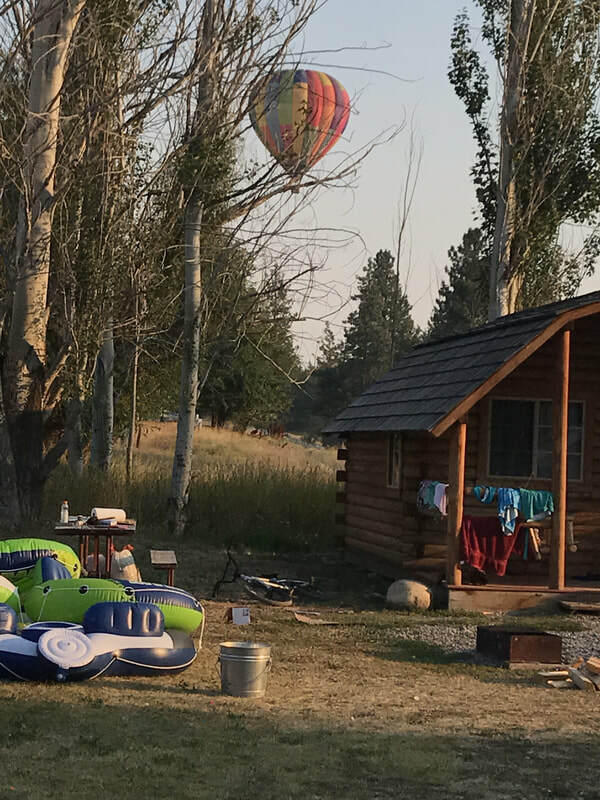 The next morning we were woken up to the sound of hot air balloons being inflated. We got up and packed up. As we were leaving Winthrop, Jeff got a text and another student that does work for us had seen the llama van as we pulled out. Wyatt M for you Mt. Baker HS folks. Love that kid! The views were spectacular as well on the way home and all ended on a good note! HERE is your story everyone (-: I included the pictures of the view on the way home for those of you that live outside the PNW! Come visit us and see it for yourselves!